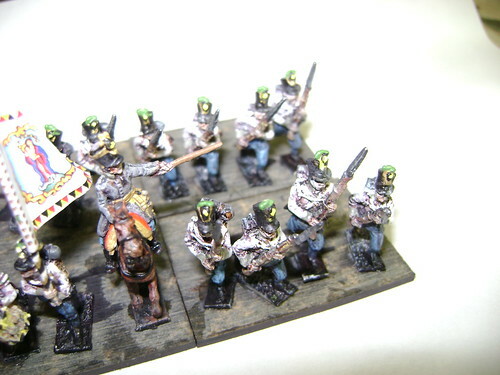 Second Infantry Unit Done (sort of): IR 60 Gyulai | Glory Eagles de l'Empereur! As you can see from the pic, the uniform of the Hungarians is different from that of the Germans in the Austrian army. Where the previous unit (IR 3) wore entirely white uniforms, with black gaiters covering their legs, the Hungarians eschewed gaiters and wore blue trousers instead. A further difference comes with their headgear – the Hungarians are wearing the shako rather than the helmet of the German unit. The Hungarians were the first to use the new shako after the reforms of 1860, the Germans not catching up until several years later. At Aspern-Essling and Wagram in the 1809 campaign, the German units continued to wear the helmet rather than the shako, for example. IR 60 fought as part of Nordmann’s Avant-Garde Division in the First Column (VI Korps) at Aspern-Essling alongside Hussars and Grenzers (fellow Hungarians) and men from the Vienna Volunteers. 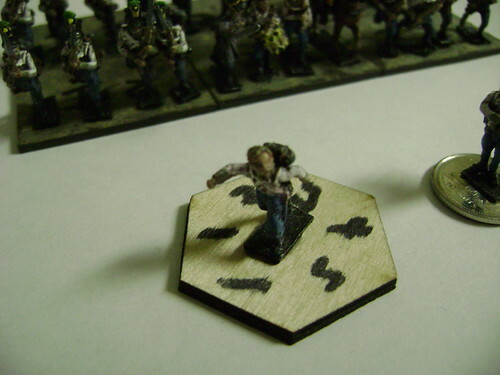 This pic shows the first couple of bases, and you can see the blue trousers and shoes. 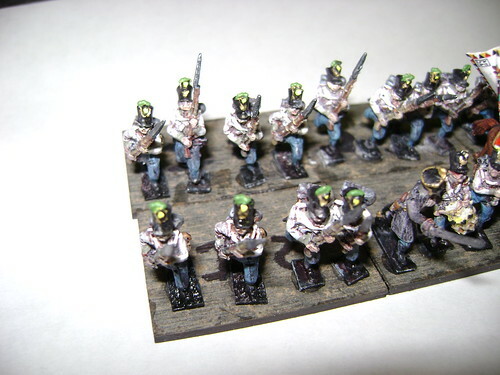 The figures are Warmodelling / Fantassin again, though they have limited poses compared to the Germans, so all of the front rank are charging forward (the second rank will be in march attack pose). 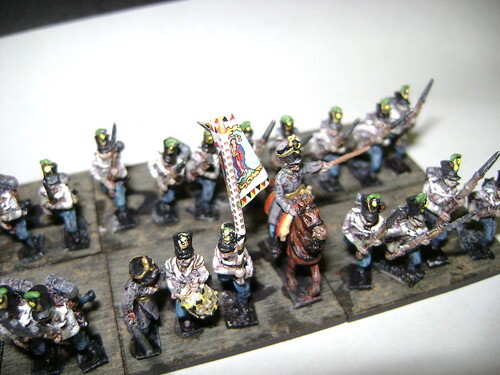 This pic shows the command figures, with the standard bearer carrying the Leibfahne, with the Imperial Eagle on one side, and the Virgin Mary on the other, on a white background. Compare with IR 3 which has the Ordinärfahne, a yellow flag with the Imperial Eagle on both sides.The flag, as before, is from Fighting 15s, and I highly recommend them. A dab of paper glue is all that’s needed and they’re easy to place. This pic shows the final stands of the unit, a large one in Lasalle terms. The cuffs and collars of this unit are steel green. 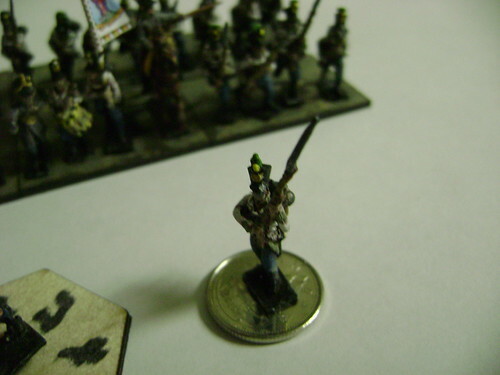 The IR 60 infantry unit has only one skirmisher point in Lasalle terms, so I’ve again used a single figure to show this. The figure is an AB one, which fit in nicely with the Warmodelling / Fantassin ones. Since they’re basically just markers, I’ve mounted him on a dime (cheap bases!). The final pic is of the casualty stand for this unit. 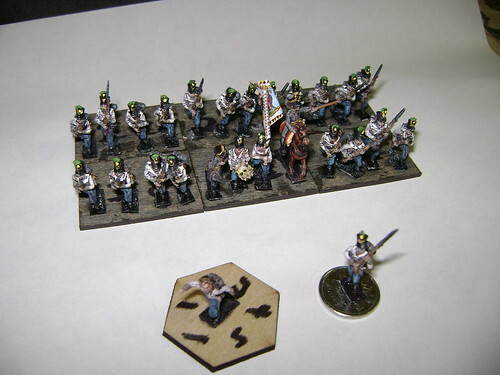 Rather than just use generic markers for casualties, I decided to get some casualty figures (Warmodelling / Fantassin again) so that each unit would have their own individual casualty marker. That way, if I have several units on the battlefield, there’s little chance of getting them mixed up. I quote like this one, he’s lost his shako, and is running from the field of battle rather than face the Frenchies.